It is incredibly simple but seemingly impossible for architects and engineers in the construction industry to find the north arrow on a compass. Maybe they just didn't join the Boy Scouts when they were growing up?! To heat a home in the winter, whether in the desert (which can be sunny and yet cold) or in a cloudy temperate zone rain forest in northern climes, the best solar collectors bar none are windows on the south side. Trouble is, first you have to find the south side. That's apparently the hard part. If your floor plan offers you a garage on the south side, forget it. You might have a warm car but you will be burning the midnight oil to keep warm. If you have only doors, hallways, closets and bathrooms on the south side, your clothes might be warm when you put them on, but you will still be needlessly spending a lot on heating. Windows South! In the past few years, the construction industry has introduced new "low-E" window technology which offers high insulating properties. But when government got on board, this new advantage got bundled with a severe hidden liability. The government had to take into account the fact that designers no longer carry compasses. What could possibly have gone wrong when government jumped on board to achieve their laudable energy conservation goals? Sadly, in order to simplify the regulations to accommodate those developers and architects who had lost their way, all windows are now conveniently deemed to be the same, regardless of window orientation (north-south-east-west). The result is low-E glass, delivering good cold weather and night time insulation combined with severely filtered solar heat gain, down to 25%-30% of normal. You're sitting by the window; it's cold outside but the sun is streaming in through the window ... and you're nearly freezing. In the yellow, orange and red zones, all which experience cold winter weather (except perhaps for southern Florida), Energy Star requires that all windows must be stingy and let through less than 40% (yellow), 30% (orange) or 27% (red) of the sun to keep you warm. In the colder northern zone, your solar heat gain (SHGC) is only required to be greater than 35%-40%. I'm sorry, that's just not enough. 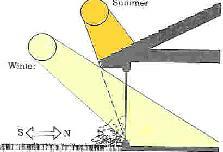 Though low solar heat gain makes sense for windows on the west side of a home, to cut out the sunlight on the south side is a travesty. 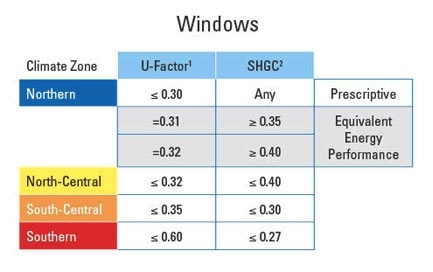 If you are specifying windows for your home, seek out windows for the south side which use "low-E hard coat" glass such as Pilkington's Energy Advantage which can deliver over 70% solar heat gain while preserving the attractive low "U-factor" with its high insulating properties. "Energy Advantage™ is a pyrolitically on-line coated low-emissivity glass." In other words, they bake the coating right into the glass while it's being made, not as an afterthought like the so-called "soft coat" low-E glazing. The regular window manufacturers, dealers and installers know close to nothing about this until you get pretty far north (it's the law in Germany) but the Pilkington people are very helpful and knowledgeable. They can put you in touch with window companies where people understand the Energy Advantage.